Contract Research Organization Market size is set to exceed USD 56.5 billion by 2024; according to a new research report by Global Market Insights, Inc.
Increasing number of clinical trials being conducted worldwide is the major factor that will drive CRO market growth during the forecast period. Growing emphasis of pharma companies on R&D activities for development of potential novel products will render positive impact on the CRO business growth. According to The Association of the British Pharmaceutical Industry (ABPI), R&D expenses as a portion of worldwide sales reached up to 20.4% in 2016. R&D commercialization and augmented specialty in the drug industry will spur the CRO market size. Growing technological advancements in clinical trials is another key driver that will accelerate the industry growth. Technology plays a crucial part in clinical trial projects as well as post-approval of products. Innovations in technology to offer efficacy and safety in product development process will drive CRO market growth. However, intellectual property problems occurring at several points during the research may hamper business growth over the forthcoming years. Early phase development services segment held significant revenue share in 2017 and is estimated to show highest CAGR of 7.8% over the analysis period. Segmental growth is attributable to growing investment in R&D activities for development of innovative products. Conducting early phase trials, Proof-Of-Concept (POC) and First-In-Human (FIH) as multicenter studies can offer substantial advantages for discovering exact target population and refining recruitment. Thus, early phase development services are vital fragments of effective drug development that will accelerate the CROs market growth in the coming years. Oncology segment dominated the CRO market with USD 18.6 billion in 2017 and is projected to show lucrative CAGR over the forecast timeframe. Cancer is one of the leading causes of mortality in developed as well as developing economies. Increasing prevalence of cancer has accelerated the pace of cancer research for developing safe and efficient treatment. Rising government and private funding for oncology drugs will further drive business growth. Pharmaceutical and biopharmaceutical companies segment accounted for 54.7% revenue share in 2017 and the segment will witness robust growth in the coming years. Segmental growth is attributed to growing investment in new drug development coupled with increasing government support. Growing adoption of CRO services that offers various pharmaceutical research, essential for conducting clinical trials during complicated drug discovery process will spur segment size over the forecast period. U.S. CRO market dominated North America region and was valued at USD 13.1 billion revenue in 2017 and is expected to show similar trend over the coming years. The high growth is attributed to strong foothold of major pharma and medical device companies coupled with extensive drug development activities in the U.S. Moreover, high healthcare expenditure in the country and growing concern regarding drug safety and adverse drug reactions among the population will boost CRO business growth. China CRO market is projected to show lucrative CAGR of 8.9% over the forecast timeframe owing to the growing burden of chronic diseases and presence of large patient pool. 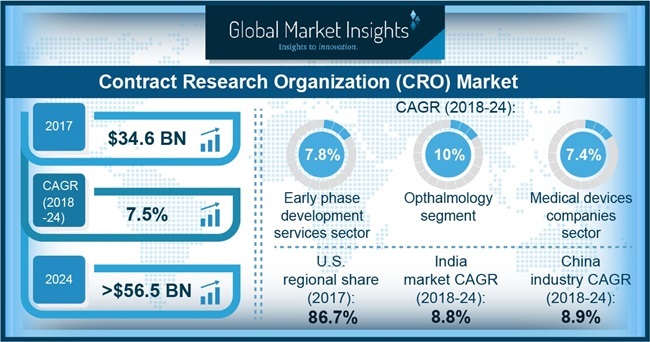 Moreover, healthcare reforms in China as well as presence of highly qualified healthcare professionals that provide CRO services at lower costs offer several opportunities for contract research organization industry growth. Prominent industry players operating in the CRO market include Parexel International, Laboratory Corporation of America Holdings (Covance), Charles River Laboratories International (CRL), CMIC, Syneos Health, EPS International, Clinipace, IQVIA (Quintiles IMS), Clinitec, ICON, Medpace, Pharmaceutical Product Development (PDD), PRA Health Sciences, Worldwide Clinical Trials, Synteract and Wuxi AppTec. The industry players primarily focus on certain strategic initiatives such as merger, acquisitions and partnership to capitalize on market opportunities and strengthen their market position. For instance, in August 2017, Clinipace Worldwide launched a new regulatory and strategic development consultancy called RSD Global Consulting. The strategy aimed at providing regulatory and strategic stage-specific solutions for all phases of development, marketing applications and post-marketing support in the U.S., Europe, and Asia Pacific.